I’m not American, and so have never celebrated Thanksgiving, but given an excuse I’ll have a party anytime. Pumpkin pie looks yummy, and it’s always nice to stop every now and again and think about those things in your life that you appreciate, or are thankful for. For the record, I’m grateful for the love of my family and friends; living in a peaceful neighbourhood (this wasn’t always the case); I feel lucky that I enjoy the work I do and am so glad to be near to nature and to know that many people around me care for both the environment and our non-human animal friends. What I’m most definitely not thankful for is the fate of turkeys at this time of year. It seems odd to me that folks in America sit down to a turkey dinner with their family only a month before they, um, sit down to a turkey dinner with their family at Christmas. Has anyone seen the bizarre ritual of ‘the pardoning of the turkeys’ (they usually bring two, as one’s a spare) at the White House each year? This so-called tradition was only formalised in 1989 by the then president George Bush Senior. Before then there had been talk of ‘pardoning’ by John. F. Kennedy and Regan, but these were just throwaway lines. Every president from eighties Bush (ooh, that sounds wrong…) to Obama, has gone though this pointless charade. I say the word pointless advisedly, as because turkeys bred for eating are usually too fat for their fragile skeletons to support, the ‘pardoned’ turkeys don’t normally live to see the next Thanksgiving. They used to be sent off to a faraway farm, or take part in the Thanksgiving parade at Disneyland (I bet they were thrilled…) but since 2010 they head off to a farm near the White House to live out the rest of their, short, lives. There’s something else. 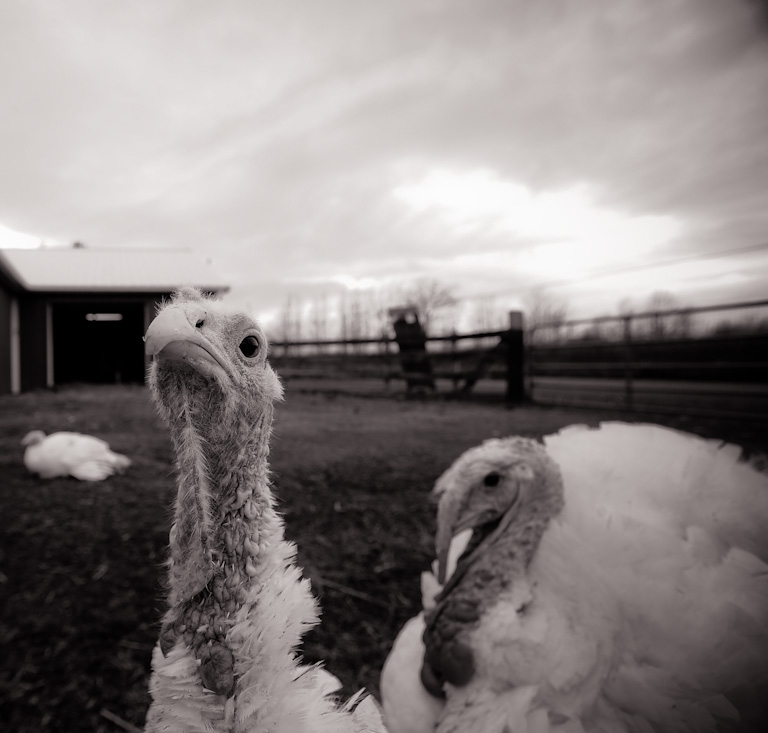 Why on earth do the turkeys get pardoned? What crime have they committed or even been accused of? (I charge you with, er……being a turkey) I mean really, what kind of screwed up logic is that? It’s all a bit weird considering that Benjamin Franklin wanted to have the wild turkey as the national bird of the USA, instead of the bald eagle. In the wild, male turkeys can fly up to 50mph, whereas modern males who are farmed for meat are force to fatten up so quickly that they can’t fly at all. A turkey’s natural lifespan is ten years. Most from farms are slaughtered at ten weeks. The abuse of turkeys isn’t just an American problem of course, as coming up to our own festive season there will be around ten million turkeys slaughtered here in the UK, just for the Christmas rush alone. This is when most of them haven’t even been outside -they spend their short lives in cramped sheds. So if you do celebrate Thanksgiving, tuck into the pumpkin pie, sweet potatoes and stuffing, (or any of the other yummy vegan dishes out there) but spare a thought for the turkey, who is after all a highly intelligent and sensitive bird, and think about having tofurkey instead. Or check out the movie Free Birds for a fun alternative.